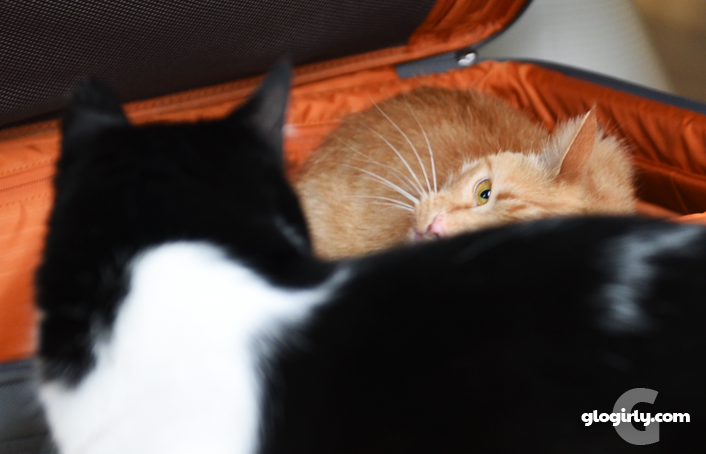 KATIE: Waffles, what are you doing in your suitcase? WAFFLES: Waiting for Glogirly. She's coming home soon so I thought I'd wait for her here. KATIE: Waffles, the last thing Glogirly will want to see is another suitcase. WAFFLES: Even if I'm in it??? KATIE: Fine Waffles, go ahead and wait in there. Just don't expect your regular meal service here. WAFFLES: Can't we get takeout? Just when we thought our girl would be jetting home to us, we just found out she's been asked to stay one more day to help out a dear friend she's made on her trip. So Waffles will have to sit in that empty suitcase for one more day and one more sleep. Thank COD she'll be back in time for Waffles Wednesday. ...ok, we know what you're thinking. Wait, Waffles has his own suitcase??? BTW, I totally believe that Waffles has his own suitcase! I've been bugging my human for one of my own too - after all, you can check TWO bags on Southwest! Waffles is colour co-ordinated with his suitcase too! HUH! And I can't get the R2-D2 carry on I wanted - life is SO unfair!! Glogirly is a wonderful friend. Waffles you will have to give her a great big hug when she gets home. Glogirly is a sweet friend.... We know she wants to get home asap! Not another day! That is like a year in kitty time! But she is doing something very important - helping a friend who needs her. She'll be home soon, but in the meantime you still have Gloman! How did you find a suitcase that matches your furs Waffles? Hope your day goes fast. Have a great week. We hope she's bringing home some extra treats for you two for extending her trip one day. Your reunion will be worth the wait! In the meantime, tell Glogirly that she's such a super sweet friend! At least the suitcase is orange inside. Good thing Gloman is there to take care of everybody. Another day! You will have to wait in your suitcase longer than you expected, Waffles. One more day can seem like an eternity! Pffft, doesn't she know her kitties want her home NOW! Not tomorrow? Have a grand reunion on Tuesday. Hope your reunion today am furry goods! 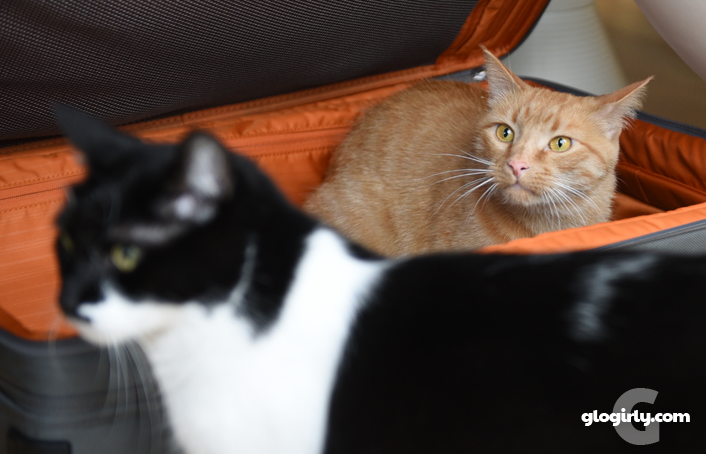 wait what - no breakfast in suitcase? OMC another DAY? How can she do that to you? One more day!!!! Deep breaths! You can make it. Let's send good vibes to Glogirly for a safe trip back home! We all can't wait to see her! One more day? That’s unacceptable.